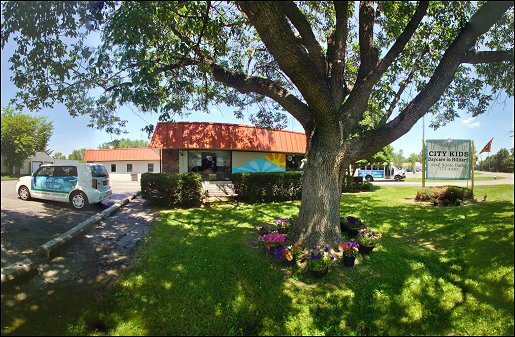 City Kids Daycare in Hilliard is located at 4940 Scioto Darby Road in Hilliard, Ohio, a suburb located just northwest of downtown Columbus. Throughout its 6,000 square feet of space, this daycare location provides a safe, secure, warm and enriching environment for your child. We provide care for infants beginning at 6 weeks of age, as well as toddlers and pre-schoolers, and we offer a before and after school latchkey program for children in kindergarten through fifth grade. City Kids provides transportation to several area schools on our licensed activity bus. Children are divided into classrooms created to fit the needs of the childrens age and developmental level. City Kids Daycare in Hilliard is open from 6:45 am - 6:00 pm. In addition to a stimulating educational environment, this location offers climbing equipment, balls, games, and movement activities in our indoor playspace which compliment the age appropriate outdoor playground and nearby parks. At City Kids Daycare in Hilliard, we encourage parents to drop in any time, take part in classroom activities, and be involved in our program. Babies are on their own schedule; they are fed when they are hungry, sleep when they are sleepy and are changed whenever needed. Hugging, laughing, and playing are part of everyones day. Caregivers in the infant room work with parents to be sure each babys schedule is appropriate for that childs and familys needs. Pre schoolers and Toddlers are involved in many activities throughout the day including art, stories, blocks, imaginative play, music, numbers, and social play. We encourage children to participate in their own way in all the fun activities. We also have a great balance between academic activities for building school readiness and "fun" ! So while the children are singing, dancing and play planned around theme based weekly lessons, we are also reinforcing the skills they need to set them up for academic success. City Kids in Hilliard offers a before and after school program for children attending Hilliard city schools. We provide breakfast and early morning care for kindergarten through 5th grade students where they can relax and talk with friends before school. We also welcome them back after their school day for either lunch (kindergarten) or snack (1st through 5th grade) and fun activities for the remainder of their day. Their classroom provides for activities including computer games, arts and crafts activities, piano, board games, role playing, manipulative and blocks, and group time. We also have an outdoor playground where our school age children have a great time running, climbing, and being active. With our summer program being designed to find that perfect balance between fun and education, we really listen to our students to make sure we are fulfilling their need for a fun summer, as well as the need for a safe place for parents to send their children. Even though we have a strong structure and teachers with plenty of fun and creative lesson plans, we are always open to new and exciting suggestions from the parents and children. Spending your summer at City Kids Daycare is like being on a fun vacation, designed just for kids and located close to your own backyard! !